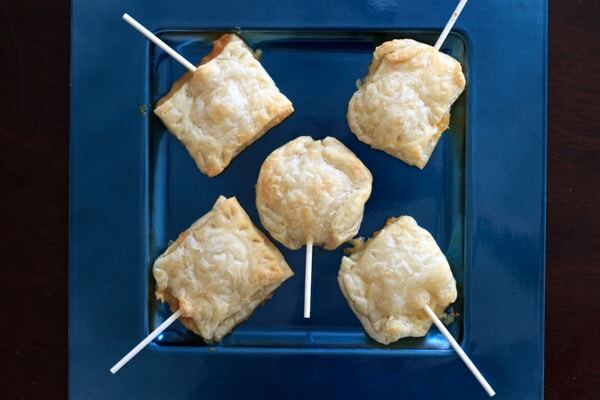 These baked brie pops will be a hit at any gathering! A great alternative to a plain cheese and crackers appetizer. These brie pops were a lot of fun to make. 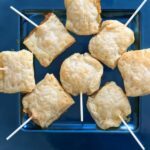 I have seen brie pops around for a little while (like here and here), but every time I wanted to make them I was out of puff pastry. 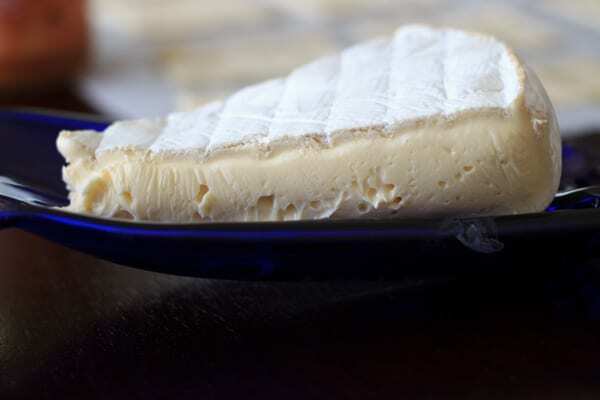 Or brie. Or time. I knew they would be good because one of my favorite go-to appetizer recipes is brie on puff pastry, with a little bit of jam on top. So basically, this is that same recipe only with more puff pastry on top with a stick. You don’t even have to put them on a stick. 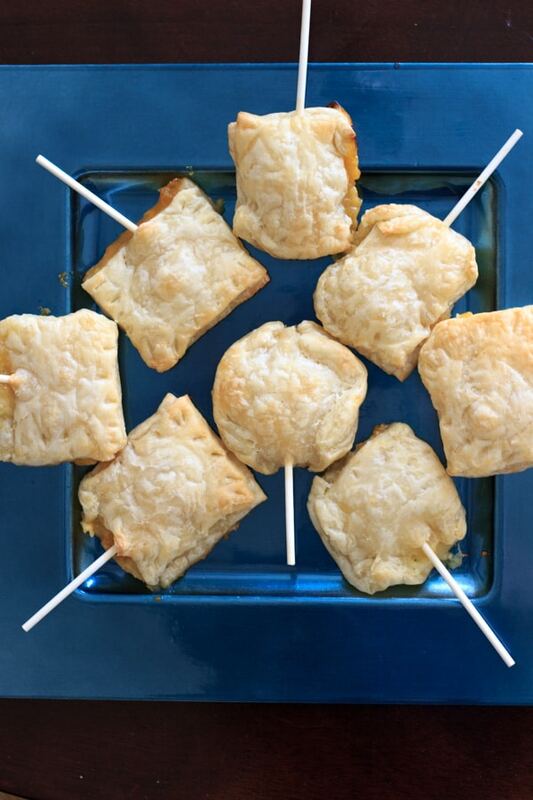 You can just call them baked brie bites! But who doesn’t like snacks on a stick? Everything you need is pictured below. 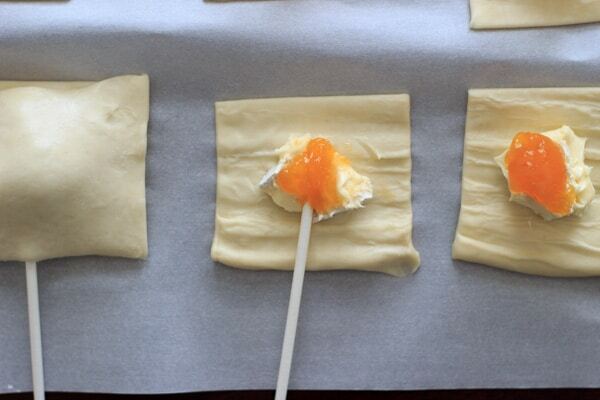 If your puff pastry was frozen like mine, let it thaw first and then cut into 12 squares. 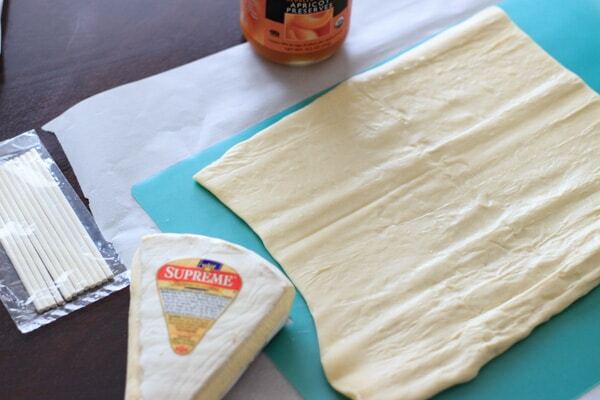 You’ll do this with two sheets of puff pastry, for a total of 24 squares. Place a spoonful of brie on half (12) of your squares. I’m guessing I used about 4 ounces of cheese. I started out with what’s pictured below and ended up with this. But I mean, can you blame me? Look at all that gooey goodness. It was double stuffed! Literally, that’s what it said on the package. On top of the brie cheese, add a spoonful of jam. I used apricot, but you can use any flavor. If you’re using cake pop sticks or popsicle sticks, place one end in the middle of your cheese. Then use the remaining 12 squares to cover the cheese and press down slightly on the edges. You can play around and make different shapes, or use a fork to make a design on the side of your squares. Perfect to serve as an appetizer, if your friends are lucky enough for you to share. Trust me, they won’t last long. 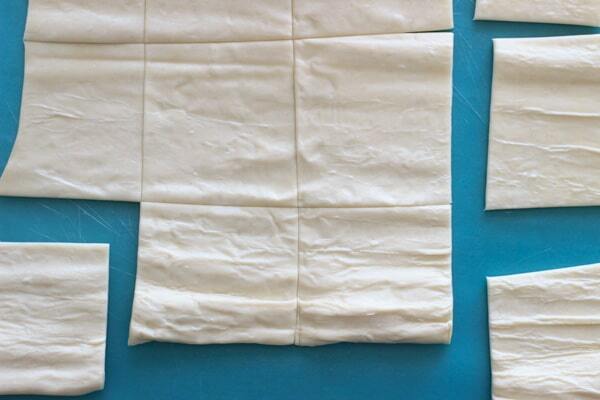 Cut each sheet of puff pastry into 12 squares for a total of 24 squares. On half (12) of those squares, put some brie cheese in the middle. Spoon jam on top of the brie cheese. 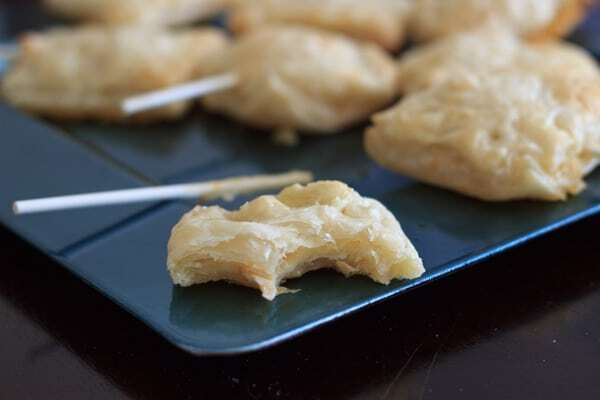 If using cake or popsicle sticks, place one end of the stick in the middle of the cheese mixture now. 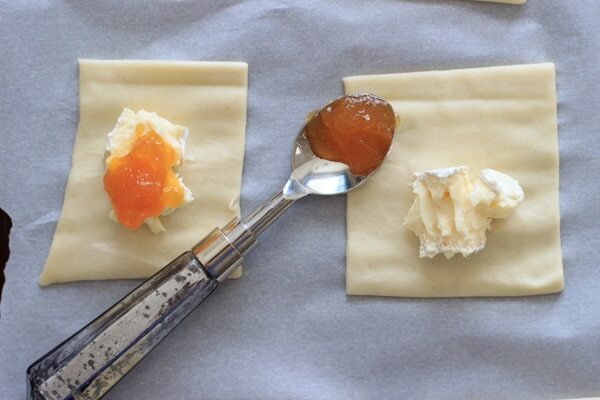 Use remaining 12 puff pastry squares to enclose the cheese and jam, pressing down slightly around the edges to seal. Cook at 375 degrees Fahrenheit for 13 to 15 minutes, or until slightly brown. Serve warm.